Oil prices are about one half what they were a year ago and the Canadian dollar has swooned. That’s good news for the East, bad news for the West. But those expecting a dramatic change in fortunes have to be disappointed: Alberta real estate has not cratered and Eastern manufacturing has not roared back. That should not be surprising, explained Scott Chandler, president and CEO of Cushman & Wakefield Ltd.
Cushman, which recently released an analysis of the first quarter, has seen some initial evidence of the Eastward shift in real estate momentum that has resulted from the plunge in oil and the loonie. The real estate sector received a pleasant January surprise when the Bank of Canada unexpectedly cut the key lending rate by 25 basis points. That has resulted in 10-year bond yields declining a further 50 basis points to 1.28 per cent in February, strong performances by Canadian stock markets so far in 2015, “bolstered in part by strong earnings results among the banks and among some large merchandisers” and a follow-on performance by real estate. The Canadian real estate equity index has not kept pace with the overall market over the last month, but remains well ahead of the composite Canadian index on a quarterly and annual basis and remains in line with U.S. counterparts over the same periods, Cushman notes in its report. “Without a doubt, the low interest rates are really helping the investment market,” said Chandler. In the first quarter, fund advisers picked up the slack from real estate investment trusts when it came to buying activity. But a handful of REITs/REOCs, particularly Cominar REIT (CUF.UN-T), Allied Properties REIT (AP.UN-T), First Capital Realty (FCR-T) and RioCan REIT (REI.UN-T) were active in the market. 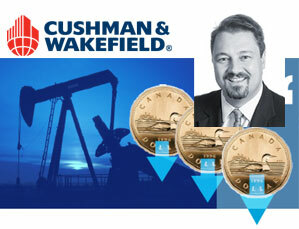 Cushman noted Canadian capital continues to be deployed in markets outside our borders, a trend not likely to end any time soon, despite the recent decline of the loonie. The firm has found over the past two years the flows of real estate equity leaving Canada “far outweighs” the incoming capital invested – to the tune of $20.2 billion and $25.7 billion leaving the country in 2013 and 2014, respectively, while just $2.6 billion in $3.6 billion came into the country in those years. The big increase in outbound money, primarily to the U.S., can be chalked up to Canadian pension funds upping their allocations to real estate and seeing little available to buy at home in terms of “core” opportunities. Besides the U.S., that pension money has been deployed to major markets in Europe, South America and Asia. Chandler, and Cushman & Wakefield have kept a fairly low profile since he was appointed president and CEO in the fall of 2013. “The company is growing, there is lots of stuff on the go, on the hiring front a bit, but it is great,” Chandler said of his time at the helm. C&W Canada’s staff count is relatively unchanged at about 520 across the country through 10 corporate offices. Chandler, a former vice-president of Cushman & Wakefield LePage who rejoined the firm in 2012 after a decade in the investment banking industry, has overseen a subtle transformation at the company. Before returning to C&W Canada, he was a director at Scotia Capital where he led the real property advisory and underwriting services for the investment bank.